A veritable bundle of piscine energy, the Salmon Shark (Lamna ditropis) adopts a lifestyle very different from that of the Greenland Shark (Somniosus microcephalus). Rather than conserving its energy through extended periods of languidly waiting for feeding opportunities, the Salmon Shark is a decidedly pro-active predator: a long-distance, high-speed hunter capable of extended bursts of hyperkinetic activity. From the tip of its conical snout to the flap on the end of its crescent-shaped tail, the Salmon Shark is a formidable predator. Its eyes are large and well developed, the better with which to spot potential prey. The Salmon Shark’s teeth are large, each with a smooth-edged main blade flanked on either side by a small basal cusplet. Such teeth are well suited to grasping slippery-bodied, bite-sized prey on the fin. The Salmon Shark’s jaws are long and thickly muscled, granting it both significant predatory reach and impressive chomping power. Its heart is thick-walled and its gills large, enabling the shark to pump a large volume of activity-sustaining blood with each beat and to exchange gases efficiently with the cold, oxygen-rich waters through which it swims. The Salmon Shark’s tail stalk is narrow with stout lateral keels supporting a lunate caudal fin, affording efficient propulsion with minimal drag. In many respects, the Salmon Shark resembles a smaller, slightly chunkier version of its more famous cousin, the White Shark (Carcharodon carcharias). Like the White Shark, the Salmon Shark possesses a circulatory system that is modified in a way that enables it to retain metabolic heat. In fact, the Salmon Shark is even warmer-bodied than its celebrated relative — able to maintain its body temperature from 14.5 to as much as 28 degrees Fahrenheit (8 to as much as 16 degrees Celsius) above the temperature of the surrounding water. The Salmon Shark inhabits waters ranging from 38 to 72.5 degrees Fahrenheit (3.5 to 22.5 degrees Celsius), with most catches recorded at a water temperature of about 57 degrees Fahrenheit (14 degrees Celsius). Its ability to maintain a warm body not only enables this shark to extend its range into such very cold waters, but also to function effectively while there. A regional heat retainer around the brain prevents it from becoming addled by the chill water, while another heat-retaining system maintains the gut at an average temperature of about 77 degrees Fahrenheit (25 degrees Celsius), enhancing efficiency of the digestive tract. And by maintaining warm swimming muscles, the Salmon Shark is able to search for prey over wide swaths of the ocean, at a sustained cruising speed that few other sharks could muster. Beached Salmon Shark pup. For unknown reasons, young sharks of this species frequently wash up on beaches along the Pacific coast of North America. Photo courtesy of Parks Canada, Pacific Rim National Park. The Salmon Shark is reputed to be a voracious feeder, but little is known about how much it actually eats during a given period. Salmon Sharks are, of course, named for their dietary predilection — the flesh is often stained salmon red, just like that of its favorite food. In attacking salmon, these sharks are extremely persistent and acrobatic, often leaping repeatedly out of the water in ‘hot pursuit’. Adult Salmon Sharks apparently migrate in loose groups of 30 to 40 individuals, following schools of Pacific salmon — including Sockeye (Oncorhynchus nerka), Pink (Oncorhynchus gorbusha), Chum (Oncorhynchus keta), and Coho (Oncorhynchus kisutch) — as they swim along the great arcs of current flowing off the coasts of northern Japan and the Kamchatka peninsula, the Aleutian Island chain, Alaska and British Columbia. The mental image of a group of these stubby sharks picking off schools of salmon as they migrate around the North Pacific always reminds me of a late-summer mob of children chasing an icecream truck. But the Salmon Shark does not live on salmon alone. Other prey species in the northern part of the Salmon Shark’s range include Pacific Tomcod (Microgadus proximus), Walleye Pollock (Theragra chalcogramma), tuna, Chub Mackerel (Scomber japonicus), herring, Atka ‘Mackerel’ (Pleurogrammus monopterygius— actually a pelagic greenling of the family Hexagrammidae), sculpins, lumpsuckers, Longnose Lancetfish (Alepisaurus ferox), Daggertooth (Anotopterus pharao), and the Spiny Dogfish (Squalus acanthias). In southern parts of its range, the Salmon Shark feeds chiefly on squids, lanternfishes (Myctophidae), Pacific Pomfret (Brama japonica), and Pacific Saury (Cololabis saira). Clearly, the Salmon Shark can — and does — eat virtually any cold-water creature it can catch. No matter how effective an individual Salmon Shark is as a predator, evolutionarily speaking, it doesn’t matter if the animal fails to breed. Salmon Shark mating apparently takes place off Alaska during autumn, from September through November. Like other members of its family (Lamnidae), the Salmon Shark is ovoviviparous, the late-term embryos being nourished by eating thousands upon thousands of tiny, unfertilized eggs. The gestation period in this species is believed to be somewhat less than a year, but details are lacking. Usually two to four pups are produced per Salmon Shark litter; their length at birth is about 31.5 to 34 inches (80 to 87 centimetres). The young are born in selected nursery areas offering rich feeding and relatively few potential predators. In the eastern North Pacific off the coast of Alaska, Salmon Shark pups are apparently born in late spring, during the month of May. Similarly, in the western North Pacific, pups are born over several spring months, from March to May, in offshore waters northeast of Honshu and south of the Kuril Islands. Juveniles measuring 27 to 43 inches (70 to 110 centimetres) long are abundant north of the Subarctic Boundary, which may serve as a nursery area. Interestingly, young Salmon Sharks measuring between 43 to 47 inches (110 to 120 centimetres) long do not seem to migrate, possibly to save energy that can then be put toward evasion of predators and growth. Salmon Shark pups grow remarkably quickly. The young sharks grow to a length of 47 to 55 inches (120 to 140 centimetres) by the end of their first year — an increase from their size at birth of up to 75%. Subsequently, young Salmon Sharks grow 4 to 6 inches (10 to 15 centimetres) per year up to age four. From their fifth year, females of this species grow faster than the males. A ten-year old female Salmon Shark will be around 7.2 feet (2.2 metres) in length while a similarly aged male will be only 6.9 feet (2.1 metres) long. Longevity of Salmon Shark males is estimated to be about 25 years and of females 17 years. 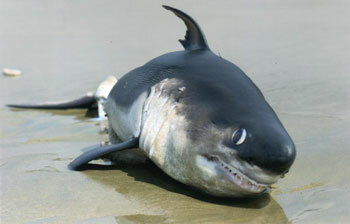 Thus, the total reproductive output of an individual mother Salmon Shark is, at most, only 28 pups. Unfortunately, little information is available about mortality in juvenile Salmon Sharks. In some shark species, mortality may be as high as 80% during their first year of life. Potential Salmon Shark predators include Blue Sharks (Prionace glauca), Killer Whales (Orcinus orca) and, of course, humans. Commercial fishing for Salmon Sharks continues to increase off Japan and in the central North Pacific. Efforts are currently being made to establish a commercial fishery for this species off Alaska. Given its limited reproductive potential, it is doubtful that the energetic, hot-blooded Salmon Shark can long endure the onslaught of the most technologically advanced and ecologically short-sighted predator on the planet.